Chemotherapy refers to drugs used to treat cancer systemically. These drugs are administered by injection directly into the patient’s veins, and circulate through the bloodstream to attack cancer cells anywhere in the body. Chemotherapy is typically used to treat bladder cancer that has metastasized, which means the cancer cells have spread beyond the bladder to other organs. Neoadjuvant chemotherapy is the term used for chemotherapy prior to surgery. An important clinical trial has shown that the use of intravenous chemotherapy before radical cystectomy improves survival for patients with invasive bladder cancer. This type of initial chemotherapy, termed neoadjuvant chemotherapy, works to shrink the tumor within the bladder and may also kill small metastatic deposits of disease that have spread beyond the bladder. It is important to note that it does not appear that single-agent chemotherapy is helpful in improving the survival of patients with locally advanced bladder cancer. The two regimens recommended for neoadjuvant treatment are either Dose Dense MVAC or GC (discussed below). 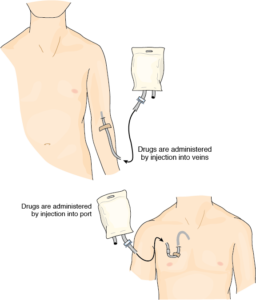 Adjuvant chemotherapy is the term used for chemotherapy following surgery. Typically, removal of the bladder also involves removal of a number of lymph nodes surrounding the bladder, which are then sent to the pathology lab for analysis. If the pathology results indicate that the cancer has spread to the lymph nodes, the doctor may recommend chemotherapy to help prevent any cancer recurrence. Dose Dense MVAC or GC are typically recommended in this setting. If bladder cancer is found to have spread to other sites, systemic chemotherapy is recommended. It is very difficult to permanently cure metastatic bladder cancer. In most cases, the goal of treatment is to slow the spread of cancer, achieving shrinkage of tumor, relieving symptoms, and extending life as long as possible. What type of chemotherapy is used for bladder cancer? Cisplatin based chemotherapy has been the standard treatment for bladder cancer for many years, based on the results of clinical trials from the 1990s. The two regimens most commonly used are dose-dense (DD) MVAC and GC. MVAC uses four drugs: methotrexate (MTX, Amethopterin, Rheumatrex, Trexall), vinblastine (Velban), doxorubicin (Adriamycin, Rubex), and cisplatin (Platinol). The advent of effective anti-nausea medication and injections that can keep immune systems from being depleted by chemotherapy have improved our ability to give MVAC safely on an accelerated dose dense schedule. The NCCN now recommends MVAC be given according to the “dose dense or DD” schedule due to improved toxicity and suggested improvement in efficacy compared with the standard schedule. A clinical trial conducted in the late 1990s showed that the combination of gemcitabine (Gemzar), plus cisplatin (GC), gives similar anticancer effects to standard MVAC combination. Both GC and DD MVAC have been useful in bladder cancer in delaying recurrence, extending life and sometimes achieving cure, and both regimens are routinely used in the neoadjuvant and metastatic settings. Clinical trials are underway to assess whether the addition of another agent to these regimens improves outcomes. Is combination chemotherapy and radiation used for bladder cancer treatment? In recent years, chemotherapy and radiation have been combined to provide a “bladder preservation” therapy for higher risk (i.e. muscle-invasive) cases. In the past radiation therapy alone was used because it effectively shrunk tumors. Bladder cancers are chemosensitive and therefore adding combined chemotherapy (multiple chemotherapeutic agents given together) to radiation has improved results. To ensure the success of bladder preservation therapy, there are at least three requirements which should be met: 1) a “complete” resection of the tumor(s) by TURBT; 2) no obstruction of 1 or both kidneys as a result of the bladder tumor; and 3) no T4 bladder tumors. If the tumors do not respond to an initial course of chemotherapy and radiation, it may be reasonable to perform, if medically possible, a cystectomy. Information and services provided by the Bladder Cancer Advocacy Network (BCAN) are for informational purposes only. The information and services are not intended to be substitutes for professional medical advice, diagnosis or treatment. If you are ill, or suspect that you are ill, seek professional medical attention immediately! BCAN does not recommend or endorse any specific physicians, treatments, procedures or products even though they may be mentioned on this site.